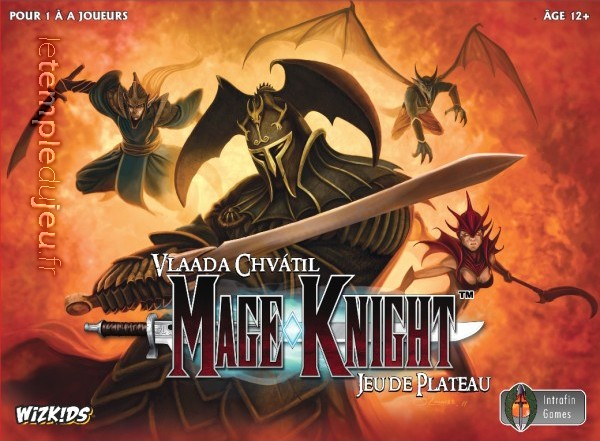 Created by the Renowned Game Designer, Vlaada Chvatil, Mage Knight is a game of Epic Exploration and Conquest that mixes character development, intrigue, and the clashing of swords to create a truly unique gaming experience ! Enter the mysterious world of the Atlantean Empire as 1 of 4 Heroes (or villians !) in this expansive world that allows players to conquer lands, steer the wheels of ... <lire la suite>. Un jeu d'aventure hors norme, stratégique et épique ! De l'affrontement, de l'exploration, de la diplomatie, du deck-building, de la réputation, du recrutement... Un jeu extraordinaire et exigent, généreux et complexe, à réserver aux joueurs aguerris. Created by the Renowned Game Designer, Vlaada Chvatil, Mage Knight is a game of Epic Exploration and Conquest that mixes character development, intrigue, and the clashing of swords to create a truly unique gaming experience ! Enter the mysterious world of the Atlantean Empire as 1 of 4 Heroes (or villians !) in this expansive world that allows players to conquer lands, steer the wheels of history and give birth to legends in this exciting all in one board game. Choose to play competitively or cooperatively with other players as you roam the countryside affecting your own reputation by being either the benevolent leader or brutal tyrant. Accumulate Fame and experience that translate into more powerful Spells and abilities, then use your power to influence units to join your ranks. Will you play the Hero and gain favor among the people or will you destroy monasteries to steal Legendary artifacts hidden within ? The Mage Knight Board Game also includes 240 cards, 8 intricately painted miniatures, 196 tokens, 20 map tiles, 54 Mana Crystals, 7 Mana dice, 2 game mats, and 2 rulebooks ! 6 units per case.